Fake news is becoming a problem on social media and even Google. Regardless of where we stand politically, the results of the 2016 election will dominate the news cycle for a long time. That includes the frightening trend of fake news on social media, something that even Facebook CEO Mark Zuckerberg has owned up to. In fact, fake news marked a portion of this weekend's episode of Last Week Tonight from HBO and John Oliver. You can watch that here. I embedded it at the right time, but in case that doesn't work the discussion about fake new starts at 12:15. Now, The Washington Post has a story on Google's search engine falling victim to the problem. Following the election last week, Google offered the results on its search engine. The top news story it linked to for a while was literally faked and false. That story linked to this tweet as its source. That Twitter user points to an article on a site called USASupreme.com for its source. That site offers no source for its count. That news story indicated that Trump had won the popular vote as well as the Electoral College votes, though that's not true. At the most recent count, Clinton holds 61,039,676 of the popular vote compared to Trump with 60,371,193. I'm not writing this story to highlight that difference; instead, I offer that it's becoming a scary time to live as a reader of news online. 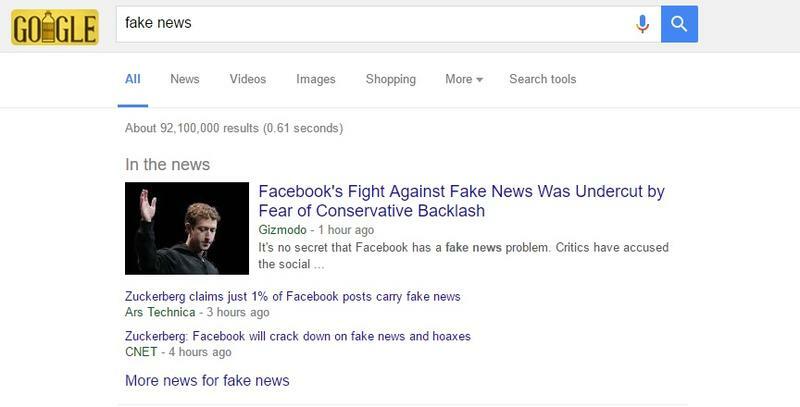 If fake news outlets have become good enough to not only trick Facebook and Twitter users but Google's algorithm itself, we have a serious problem on our hands. Zuckerberg's saying that just 1 percent of news of Facebook is fake. That may or may not be true; but, that percentage doesn't really indicate how much the fake news is actually shared. Sure 1 percent of the stuff posted on Facebook is fake, but how much more often is that fake news shared than the real stuff? How about if it's especially inflammatory? As readers, we can't take anything at face value. If a story seems too good to be true, check the organization and the linked sources. Perhaps platforms have a responsibility in this, too. I wouldn't be opposed to Facebook adopting some sort of "verified" news outlet icon for bigger outlets. They have to do something to curb this stuff, right?